When Marissa Sanchez first started her academic career at HSU, she thought she wanted to do science, but like many other students at HSU, eventually changed her major to something that truly serves her heart. However, her transition from Zoology to Theatre came only after she started volunteering as a director of Art Recreation Theatre (ART), a program that offers after school activities to children in elementary schools around Humboldt County. She admitted she had always been interested in theatrical studies, but like many of us, really took strides to be the person she wanted to be only after leaving home. From a young age, Marissa recognized theatre as a powerful way to express feelings and personal emotions, and would now like to share those skills with others. After coming into her own by teaching theatre and art, she feels she is able to move towards a career as an instructor of drama; her plan is to open her very own theatre company in her hometown of Watsonville, one that caters to underprivileged youth in the “hard” part of Santa Cruz. As many college students know, transitioning to life on your own can be difficult, especially if you find it challenging to connect with people because of conflicting values. ART director Kelly Whiteford has experienced this first hand, and shared her story about how YES changed her outlook on living in Humboldt. “Working at the YES House made me believe in people more,” Kelly proclaimed as she described her struggle with finding friends who had similar altruistic values when she first started college at HSU. Kelly is a Psychology major who admits she thought power only came with negative connotations before beginning to work as a director of ART a year ago. She now recognizes that being in a decision-making position as a leader gives her a sense of purpose, and an environment which fosters acceptance and humanitarian efforts. As someone who has struggled with language since youth, Kelly shared how ART helped her transition into recognizing how valuable the arts are to those who need other outlets to express their feelings. Like her students, Kelly uses ART to develop an appreciation for learning skills which allow communication between all people in society. 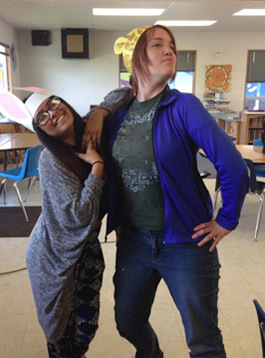 Marissa Sanchez and Kelly Whiteford demonstrating their acting skills at a local elementary school.